The elevation measurements were collected by the Mars Orbiter Laser Altimeter (MOLA) aboard Global Surveyor during the spring and summer of 1998, as the spacecraft orbited Mars in an interim elliptical orbit. 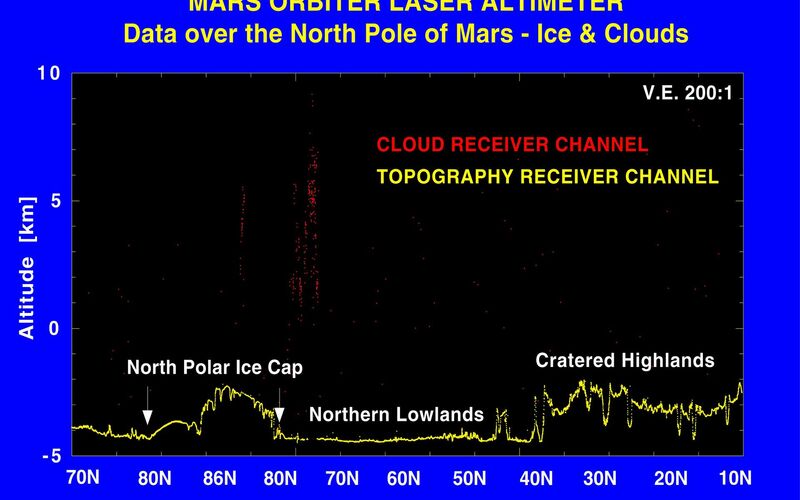 MOLA sends laser pulses toward the planet and measures the precise amount of time before the reflected signals are received back at the instrument. From this data, scientists can infer surface and cloud heights. 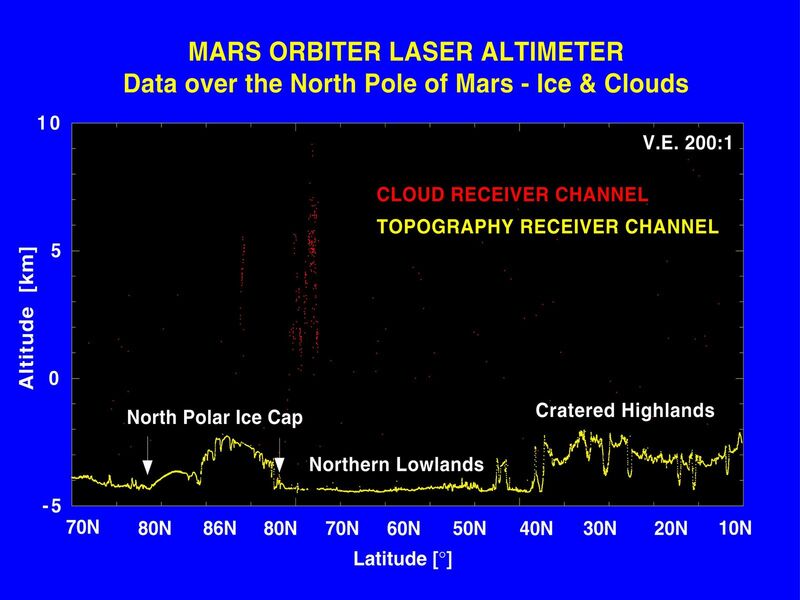 During its mapping of the north polar cap, the MOLA instrument also made the first direct measurement of cloud heights on the red planet. 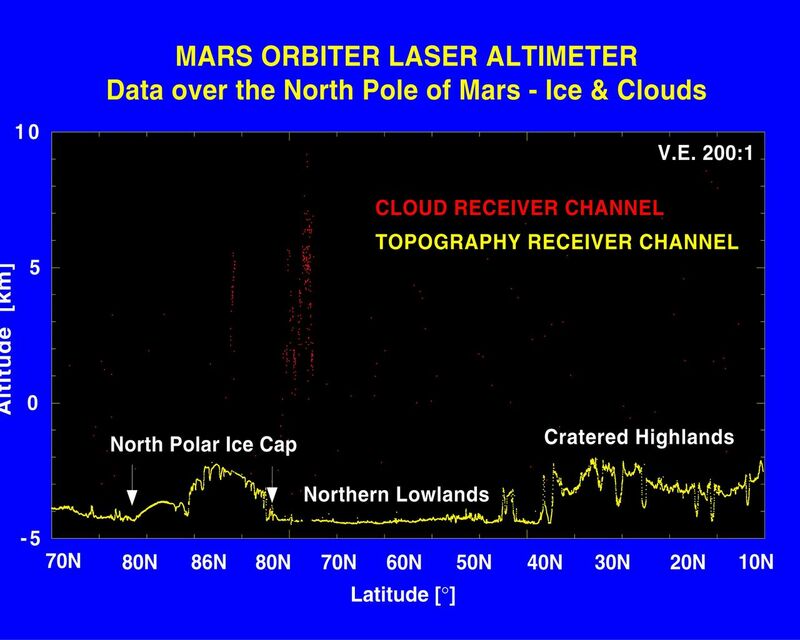 Reflections from the atmosphere were obtained at altitudes from just above the surface to more than nine miles (approximately 15 kilometers) on about 80 percent of the laser profiles. Most clouds were observed at high latitudes, at the boundary of the ice cap and surrounding terrain. Clouds observed over the polar cap are likely composed of carbon dioxide that condenses out of the atmosphere during northern hemisphere winter. Many clouds exhibit dynamic structure probably caused by winds interacting with surface topography, much as occurs on Earth when winds collide with mountains to produce turbulence. The principal investigator for MOLA is Dr. David E. Smith of Goddard. The MOLA instrument was designed and built by the Laser Remote Sensing Branch of Laboratory for Terrestrial Physics at Goddard. The Mars Global Surveyor Mission is managed by NASA's Jet Propulsion Laboratory, Pasadena, CA, for the NASA Office of Space Science.